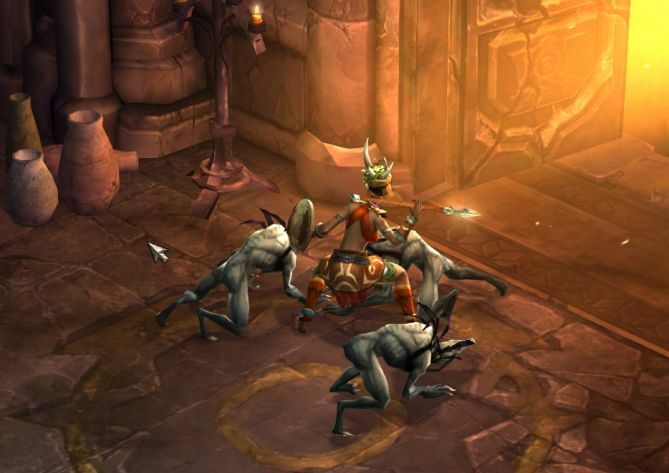 Playing With Friends #Diablo3 – Nomadic Gamers, eh! While most of my twitter feed was filled with angry players upset over the Diablo 3 errors that kept cropping up, I was having a different sort of experience. I like the fact that you need to be logged in to play, and I love the fact that my friends can jump into the game no matter where I am. I love the ease that this can be done with – although it did catch me a bit off guard to see Tipa suddenly appear in my instance I quickly figured out there’s a setting in options -> social that allows your bnet friends to jump into your instances from their main menu. My witch doctor is level 9, exploring crypts, killing wives who have turned evil. I absolutely love this class, it suits all my particular ‘wishes’ such as ranged attacks (or closer if I switch them out), pets, casting. An amazing voice over that I can’t get enough of when I listen to the story line. Tipa, Shadowgeist, and I wandered around for the better part of an hour, me with my ghoulish dogs and Tipa with her bow of awesomeness. Every time her machine gun like sounds went off and there was a bright flare of light I secretly giggled. It was fun. That’s what games are all about, aren’t they? Fun? I did eventually get kicked out with the 3007 error, but unlike those I see who are incredibly upset, I’ll just wait for it to get fixed. Patiently. I still had a great time playing with friends. It’s a bit strange for my wife and I. We really enjoyed D2. When World of Warcraft was first released, we didn’t purchase it at first as we had been hoping for D3 — we joined up with WoW a few months later, but the decision was because of disappointment with Bliz not continuing with Diablo. Now, after playing the single player campaign of Starcraft 2 and playing through Cataclysm, our attitude is now a “um… lets see.” So we are holding off for the free pass in a few weeks. That should let Bliz work out the server issues and the like, and give us (we hope) a smooth ride. And we’ll give them a chance. But we won’t purchase sight unseen. Bliz’s recent track record doesn’t fill us with confidence. A piece of advice I give to everyone playing Diablo, if it isn’t done already, go into Options > Game > Display advanced tooltips (or whatever it’s called in English, it’s one of the last options on the right column). I’ve always played the Diablo series primarily as solo games, and I expect the same for III. Certainly I intend to play through the story at least once before exploring co-op.